Two nights ago while waiting for a swatch to dry so I could start a new project, I thought I’d be responsible and whip up a quick hat for which I’d wound yarn before our Yellowstone vacation. Responsible because the yarn was wound and I knew it’d be a quick knit. 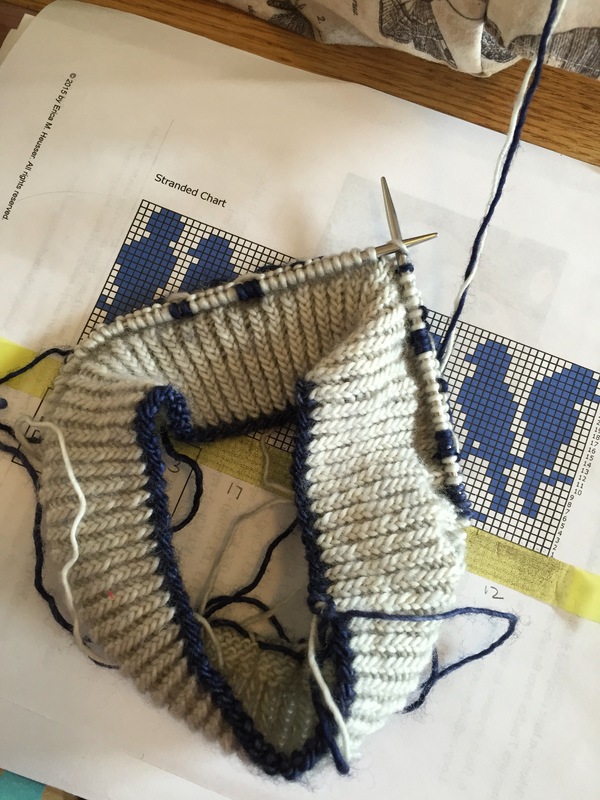 I got going on the ribbing and then had some… ahem… issues with putting it down. 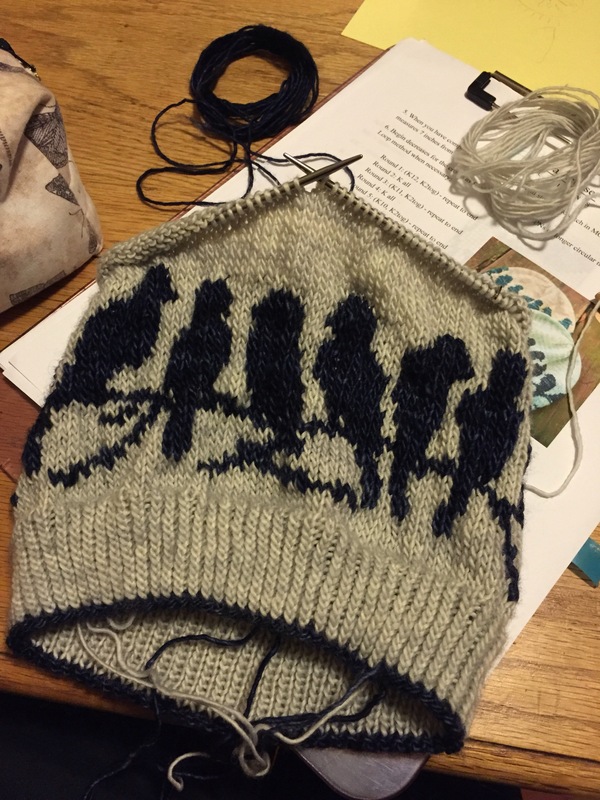 Having been on a real colorwork kick lately, knitting up the Passerine Hat would be a great choice. I’d gotten the pattern & yarn right away when the pattern was first published for some very sentimental reasons (which I’ll share when it’s finished) and I knew it would be just a treat of a project. Plus, with the feel of colorwork already in my hands, what could possibly go wrong? Well, yesterday I was knitting away, completely addicted to seeing the pattern take shape and before I knew it I was through the colorwork and beginning the crown shaping. As my bedtime crept closer and I got more tired, I started looking more and more at my little birds. The tension in the colorwork wasn’t perfect. It wasn’t bad, but it wasn’t great either. It looked fine, really, and I knew it would wear just fine, but the more crown shaping I did the more I knew I was not going to be satisfied. This treat was going to be imperfect unless I took drastic measures. As knitters, I think we’ve all been in the spot where we have a choice to make about a project. Maybe the sizing of a sweater is a little off, maybe some stitches are twisted way back in the pattern, or maybe your colorwork isn’t quite perfect. The hardest choices are the ones that don’t have an obvious answer. Yes, I could leave this hat with the little imperfect birds. I’m really not a total perfectionist and I could probably live with it. Besides, no one would know except me that they were a little off. 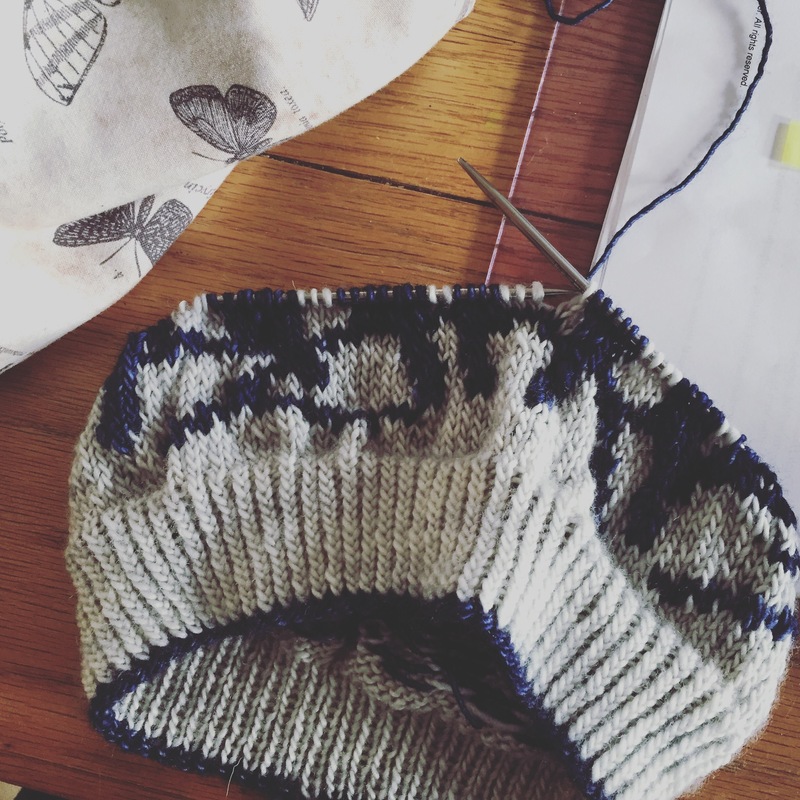 With fresh eyes and a good night’s sleep under my belt, I’m ready to have another go at this little treat of a hat and to make it the little beauty that I know I can knit it into, the adorable hat that it is meant to be. Sure, it would have been nice to have done a more perfect job the first time. Yes, it’s a little frustrating to go back and re-do basically an entire hat. But if there’s one thing I’m certain in this craft, it’s that knitting in real life is rarely perfect and sometimes it requires a second go. That’s a fact with which, my friends, I am at total peace. And on that note, here I go again! I understand your tension issues. I’m on the fourth reincarnation of a sweater. I unraveled it and started over when I had the whole body done. Yes, nobody else would have noticed, (I think your birds are lovely), but I would know and it would forever haunt me. I’m not alone! Knowing it was such a quick project definitely convinced me to just fix it. I’m about halfway through the birds v. 2 and it’s so much better! Ah yes. I know this story; I’ve knit it before, more than once, as have most of us. It reminds me of this: http://www.threewatersfarm.com/blog/index.php?s=tracks+of+my+tears&searchbutton=Go%21. Good for you to submit to enjoying the knitting of it again! “I’ve been very brave… I have no cried in public…” Exactly. Exactly! So far much happier with the second run! My motto is, “when in doubt, rip”. If I’m not happy with a knit it won’t get worn, so it is better to start again and create that item of joy that was in your heart when you started the project. I can’t wait to see the finished birds. Agree, agree, agree! Hopefully I’ll be done this weekend! Proud of you! Deciding to rip out is hard. I always ask myself, “Am I proud of this?” and that’s the answer. If I can be proud of the work, even with an imperfection or two (NOTHING will EVER be perfect! ), I rock on. If not, out it comes. It’s also the reason I try to stop when I’m getting weary – it’s when my concentration wanes. Love this pattern, BTW. I am the same way. While no one else will see the imperfections, I see them. There are some I leave in because they are ones I can live with…like @kendknitter said, nothing is perfect. It is a great hat! Thank you! I think what we leave and what we fix is very personal as we all have different expectations for what we feel good about in our knitting. In this case, I’m very glad I went back and made some adjustments! it’s a great pattern! And as mentioned above, it is much better to rip and redo than to be unhappy with it. And since you had no deadline (that you mentioned, at least) then so what? It is such a cute pattern, and you get to do it again, at no additional cost! I think I have told you that I once took a class from a woman who highly recommended ripping – as she said “Do you knit to finish things or knit because you love to knit?” if you knit because you love to knit, so what if you do something more than once before it is right? EXACTLY. This is part of why I rarely work on hard and fast deadlines any more. I want to be happy and proud of each project I finish. I think if I’m ever *just* knitting to get something done, I’ll have taken a serious wrong-turn! Well, so far so good – the things you have been making lately are just GORGEOUS. Thank you! I have been having a blast – I am way behind on posting finished projects as my Agnes sweater took a million years to dry. It’s dry now though so I should be able to start sharing everything now!